When it comes to handmade Mother’s Day gifts, there’s nothing simpler yet more divine than luxurious bath salts. 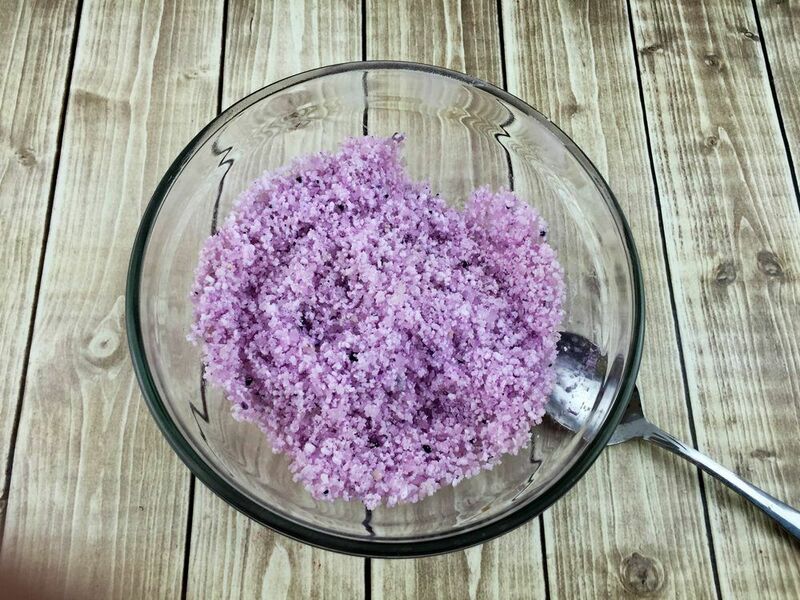 This Vanilla Lavender bath salts recipe takes just a few minutes to put together yet offers mom hours of relaxation! When I say that this is an easy Mother’s Day craft, I promise you, I’m not kidding. The hardest part of the whole project is deciding what stylish container to put it in! 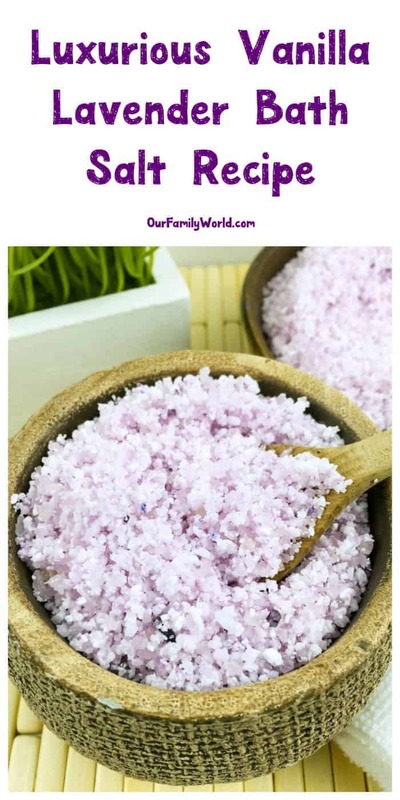 Check out how to make our super relaxing vanilla lavender Mother’s Day bath salt recipe! Don’t forget to print out the recipe card for later! Place all ingredients in a small mixing bowl and mix until well blended. If you do not use the food coloring, the bath salts will be white in color. 1. Pour 1/4 cup into warm bath water. ENJOY the calming scents of lavender and vanilla! 2. Relax in bath for 30 minutes. 3. Pat dry and apply regular moisturizer to skin. I recommend gifting and storing your salts in a clean mason jar. They make the best airtight containers and look nice too. Just tie a ribbon around the jar and you have the perfect gift. If you want, you can also add a cute little wooden scoop or spoon so your mom can easily scoop out the salts before her bath. Our recipe calls for simple Epsom salts and sea salt. 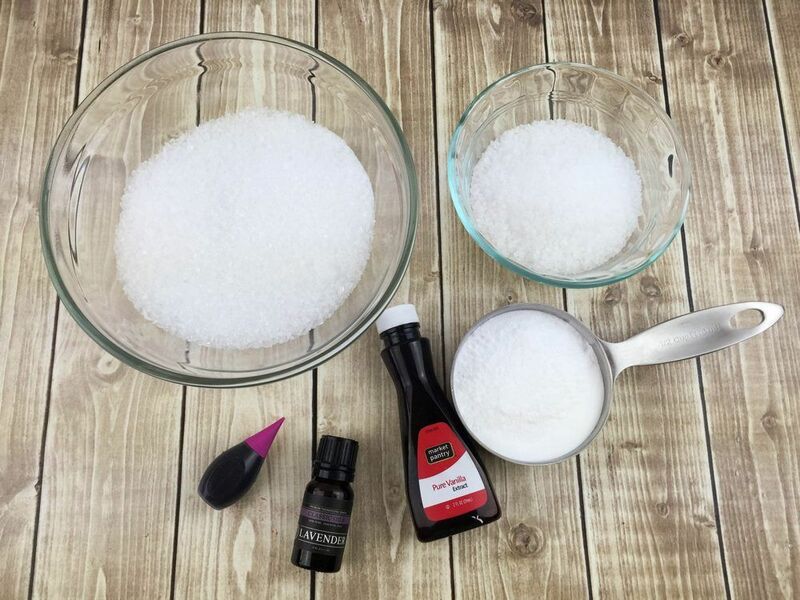 Now, if you can’t find sea salt (or don’t want to pay extra for it), you could absolutely make this entire recipe out of Epsom salts. It’s super easy to find in your local drugstore or mass market retailer, and it’s crazy inexpensive. Epsom salts aren’t just popular in bath salt recipes because of the low cost, either. They are actually the best salt to use if you’re looking for something that relieves aches and pains. On the other hand, sea salt (specifically the more expensive Dead Sea Salt) is great for skin-rejuvenating recipes. This type of salt is rich in minerals like magnesium, calcium, and potassium. 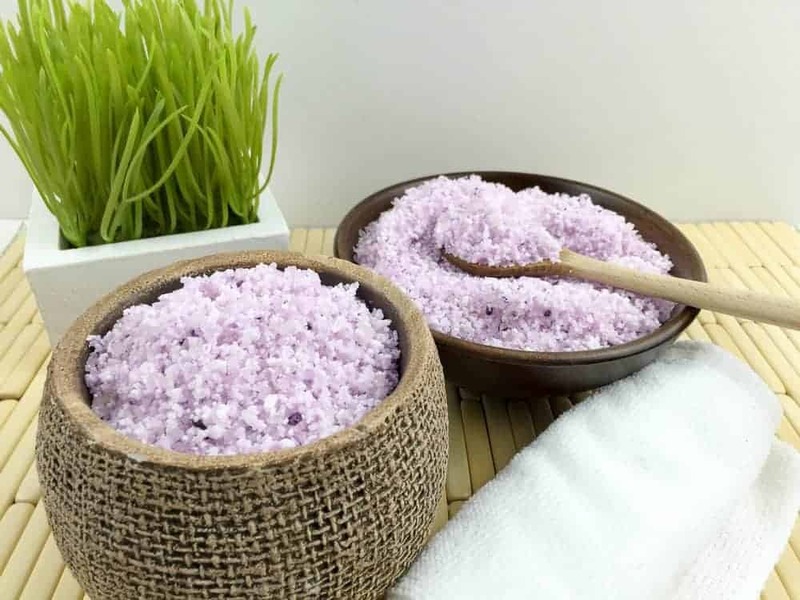 If you want to really splurge on mom, Himalayan salts are all the rage right now. Think “pink Himalayan salt.” One obvious benefit: it’s already colorful so you don’t have to add food coloring. They’re also great salts for balancing the body’s pH levels. Whichever you choose, just make sure you get plain salts and not something that already has essential oils added to it. Speaking of the essential oils, I’m going to tell you a little secret. When it comes to bath salts, you do not need super expensive oils. I bought a fabulous little starter set on Amazon that had the basics: peppermint, lavender, lemon, etc. It cost about $20 and it’s lasted me over a year. I make a TON of bath salts on the fly for my son and my own baths. Of course, there are more expensive oils out there. Rose oil (true rose oil, not rosewater or any of the “fake” oils) is crazy expensive because of the labor-intensive process and the sheer amount of roses that go into making one ounce. Your average, widely-used EOs, though are pretty inexpensive. You do want to make sure that you’re actually getting essential oils and not fragrance oils. There’s a HUGE difference. With essential oils, a little goes a very long way. Plus, you’re getting the benefits from the plant itself. Fragrance oils are just what they sound like: man-made scents created in a laboratory instead of from nature. Don’t get me wrong, they are fun to use sometimes when you want to come up with more off-the-wall combinations, but they can also be harsh on sensitive skin.